Update: Maya Esther is in the United States. Read the update. A journalist gets an unusual perspective on disaster stories. Chances are you remember the Oklahoma City bombing from the horrific television images of the demolished building or the heart-rending photograph of a firefighter carrying a dead baby from the building. I remember the bombing from the grit in the air I could feel and taste covering the aftermath in downtown Oklahoma City. You may have forgotten about the catastrophic mudslides that hit Venezuela in 1999. I will never forget walking with a woman on a devastated mountainside as she pointed at homes where she and relatives once lived. “Es mi casa,” she said, gesturing to some rubble, part of it recognizable as the top of a wall, the rest of her home swept away or buried in mud hardened like concrete. Another woman recalled that horrible night, gesturing downward with her arm, talking about the terror that came rushing down the mountainside, repeating, “cadave” — corpses sliding down in a torrent of mud. My role as editor of The Gazette during the 2008 flood has received plenty of attention, so I won’t belabor it here. And I recently recalled my role covering the 9/11 attack from a distance. In a career that started in the 1970s, I have covered dozens of tornadoes, floods and other disasters as a reporter and editor. The stories are emotional. You can’t help but feel the human impact, sharing joy and heartbreak with people you interview. But you develop a sort of professional shell that helps you function and keeps you from feeling too deeply. This week I learned a bit of what it’s like to be one of those people I used to cover, waiting anxiously to learn whether a loved one had survived, trying to bring her to safety. My niece, Mandy Poulter of Pella, Iowa, and her husband, Matt, have been working three years to adopt a daughter, Maya, now 4 years old, from an orphanage in Haiti. Maya is the first international adoption for Mandy and Matt, following two biological children and three U.S. adoptions. Adoption is a huge part of Mandy’s family. She is the oldest of three biological and 11 adopted children (four from the United States and seven from Korea, Vietnam and Guatemala) of my brother, Don, and his wife, Pam. Mandy’s brother, Luke, and his wife, Kathy, recently adopted a boy in Iowa and sister, Missy, and husband, Andrew Rock, are in the process of adopting a girl from India. None of those other adoptions had dragged on as long as Maya’s. As her case worked through the Haitian legal system, Matt has joined the board of the group that runs the orphanage, the Central Texas Orphan Mission Alliance. He and Mandy have visited Haiti several times. Maya recognizes them and calls them Mommy and Daddy, but she has never been to their home in Pella or met her brothers and sisters. 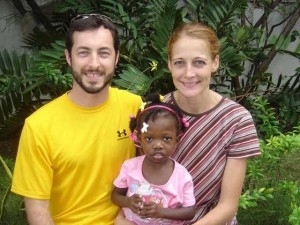 We recently learned that the Haitian government had finalized Maya’s adoption. She is legally Mandy and Matt’s daughter and they planned to bring her home in February, after processing of her U.S. passport. Of course, when we learned this week of the earthquake in Haiti, our hearts and minds turned immediately to this girl we knew only from photographs. We learned quickly by email that Mandy and Matt had no word of how the orphanage had fared and whether Maya was safe. Though I wasn’t covering the story, I started out functioning and thinking like a journalist, even though I no longer work on the news staff. Gazette colleague Molly Rossiter was looking for Iowans with family in Haiti, so I passed along Mandy’s contact information. Even among the family, I sort of functioned as a journalist, sending updates by email to extended family and friends, who spread the news further along prayer chains. My wife, Mimi, functioned from the start as a mom. Though Maya wasn’t Mimi’s daughter, she was family and Mimi was determined to do what she could to help and protect this little girl. (A friend once joked following a crisis about Mimi “putting on her civil defense hat.” She gets pretty single-minded when she feels a sense of urgency.) Mimi called Mandy and learned Matt was looking for a way to get to Haiti, so he could look for Maya. Mimi thought my media connections might help, so she gave me a call. I started spreading word of her story to colleagues I knew at the New York Times, Washington Post, Associated Press, MSNBC and Miami Herald. Again, I was thinking like a journalist, just passing along a tip. I got back several messages, saying my colleagues would pass word of the story to their colleagues covering Haiti. But as I knew and one of them noted, those journalists had thousands of possible story angles to pursue. Mimi cared about one story angle: Maya. And I wasn’t the only person she knew with connections. While I was spreading the word, Mimi was calling Washington. She alerted Sen. Tom Harkin’s office to the situation and Harkin’s office has been in touch with the Poulters, working to expedite the paperwork for Maya’s passport, so Matt and Mandy could bring her home if they could find her. The oldest of our three sons, Mike, is a former chief of staff and communications director for former Sen. Chuck Hagel of Nebraska. Mike now works for a public affairs firm in Washington, so he has maintained his strong media contacts. Mimi briefed him on the situation with Maya and told him to do what he could. As one who thinks I am well-connected in the media, I say this with a mix of chagrin and pride, but mostly gratitude: Mike has way better media connections than I do. And Mike approaches them not as a colleague passing along a tip, but as a professional who knows how to pitch a story so the media will bite. He called contacts at Nightline and the Washington Post, and soon both organizations were working the story. The Post published a story on Mandy and Matt’s efforts to learn about Maya, but it was ABC News that really came through. First Mandy and Matt did a Skype interview for Wednesday’s Nightline, sharing their story of trying to find Maya. And ABC crews in Haiti were on the case, too. Matt’s directions for how to get to the orphanage were forwarded to Robin Roberts (one of my favorite TV journalists going back to her ESPN days) in Port-au-Prince. And Thursday Roberts called Mandy from the orphanage, where an exhausted (but uninjured) Maya was sleeping on a mattress on the ground. By the time I got emails Thursday afternoon, first from Mike and then from Mandy (subject line: THEY FOUND HER!!!!!!!!!!!!!!!!!!!!!!!!!!! ), I was fully out of journalist mode and just another family member celebrating good news. Through moist eyes, I watched Nightline Thursday and Good Morning America this morning, as Roberts, on the telephone from the orphanage, promised Mandy that she’d leave food and water there for the children. Of course, Maya is just one of millions who suffered in the earthquake. Our family’s hearts go out to the thousands of families here and in Haiti who have received heartbreaking news this week. We understand the agony of countless more still waiting for the news our family received yesterday, fearing their ending will not be as happy. And, happy as we are, my family’s story has not ended. We still need to bring Maya home to Iowa. We have met, it has been a long time ago. I am Don’s prayer partner. What an amazing blessing it has been to watch all of this unfold. God truly is a God of miracles. I will continue to pray as Mat and Mandy leave in the morning to get little Maya. I have also been praying for Don and Pam’s safe travel tonight as they head to Pella. Man it is FOGGY down in these parts, my wife and I just arrived back in Shenandoah from Omaha. Thank you from the bottom of my heart for all that you have helped in accomplishing this wonderful blessing from God. Thanks, Carolyn & Dave. I waited to post your comments because Mandy & Matt were on their way to Haiti and I didn’t want to publish anything about that until I knew they got there safely. As you probably know by now, Matt and Mandy have been reunited with Maya Esther and have a visa for her. We are hoping they are on their way home now. Mandy is trying to bring home some other children from the same orphanage who were in the process of being adopted by other Pella couples. They did get four visas for other children, but we don’t know whether they will all be able to come home (Mandy and Matt’s adoption is complete; don’t know what stage the others are or whether they can leave with someone other than adoptive parents). Oh what a fantastic story. We have to celebrate every victory we can in a tragedy like this. Thanks for sharing this.